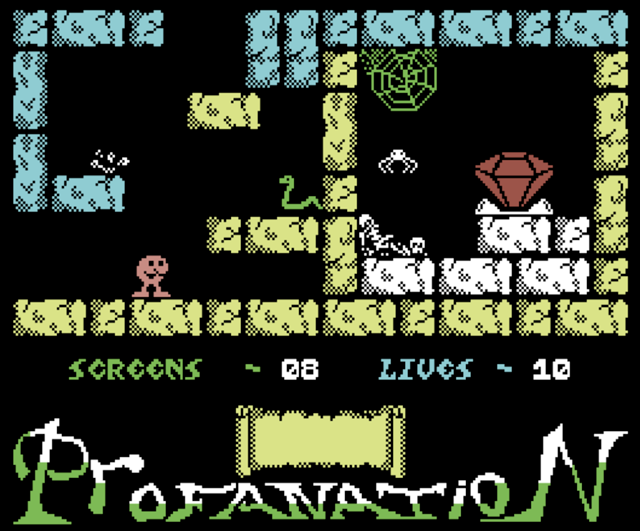 Prepare to scream profanity at your keyboard because one of the "most difficult games of Spanish Software History" has just been converted to the C64: Abu Simbel Profanation was the third in the Johnny Jones Saga and was released in 1985 for Spectrum, Amstrad CPC and MSX. 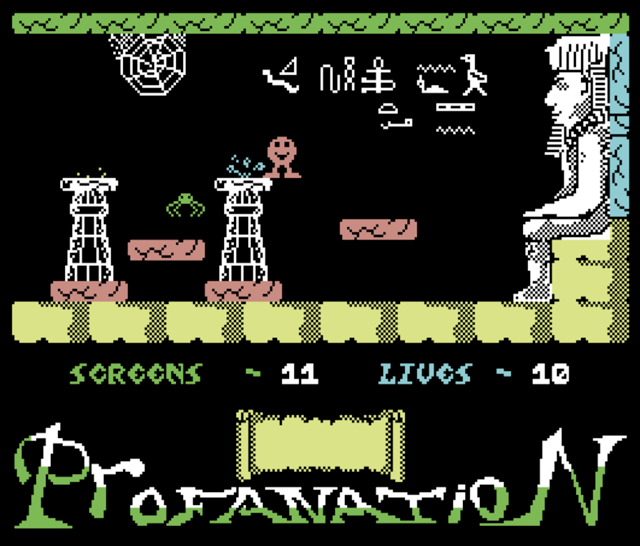 The game was developed by Victor Ruiz and released by Dinamic Software in Spain (and Gremlin Graphics throughout the rest of Europe). As Johnny Jones, you must explore the tomb of Abu Simbel and rid yourself of the Pharaoh's curse. Similar to Manic Minor, the game is a static multi screen platformer with various traps, moving enemies, keys and doors to unlock to progress. You'll be ripping your hair out in frustration at times, as a wrong move can lead you to lose not just one of your 9 lives but all of them, as you could spawn over a moving enemy which will repeatedly kill you, or above spikes which you'll fall onto over an over again. However, if you play the game in emulation, you can use the quick save and load feature, or take advantage of the the infinite lives training modes in the Laxity version. The levels are designed really well, each screen requires planning, and jumps require perfect timing and pixel perfect movements. Graphics are what you would expect from a Spectrum game, but controls are pretty good. You'll need to practice a bit but it's a very addictive game. Whether you want to rediscover the tomb of Abu Simbel, or you missed the game first time around, definitely check this one out.